The paper showing the different brain developmental course for kids and teens is now available online free at the first link below. The data are really remarkable to see, and they explain a lot. The figure below shows that the highest IQ kids had the lowest prefrontal actvation in the early elementary school years, while cortical connections really turned on the gas (passing mildly high and average IQ kids) heading into the teenage years. It'd be neat to speculate that ala the Right Brain difference post below, young advanced thinkers may more sparse but widely distributed frontal neurons early in their development. An anatomy such as this might account for why they may be so good at generating multiple possibilities for word similarities or associations, but why they may have trouble selecting from so much information (paralyzed with an open-ended writing prompt) or why the speed of processing occurs so slowly. Young brains don't have as much myelin as older brains, so like our Comcast cable, the longer the distances, the slower the signals. Sometimes it may just peter out; other times, connections may become short-circuited. We empathized with the father of a brilliant, but slow-thinking and -talking young man who murmured, "If you were to tell me that one of my kids would grow up to win a Nobel prize I would still guess it would be him, but..." Sure it's nice to know it deep down, but it's still going to be frustrating listening to all the suggestions from well-wishers that he's retarded or has PDD-NOS. 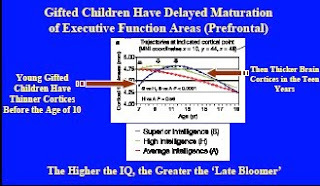 Well, the research findings here are a case in which the biology supports real differences in how the brain develops for precocious children. Wouldn't it be nice if we could customize learning experiences for more of these kids - if the classrooms of the future had teachers who knew as much about individual differences in brain development as clinical researchers. Very interesting post. Thanks for taking the time to put it online. the great teachers see the differences intuitively and adjust according to the needs of the individual child. Thank you for this post. Our son has been labeled with PDD-NOS, yet he has tested gifted in areas of visual/spatial reasoning. I have always felt he was really bright, especially when at 2 he was doing jigsaw puzzles that his 7-year-old cousin couldn't do. Yet in school (2nd grade) he is seen as a "low performer" and he has an aide, etc. I know my son has a lot to give to the world, if the world would just be patient while the rest of his brain catches up.